Mick Mulvaney says there's enough money left over to fund this quarter's operations. Interim director of the Consumer Financial Protection Bureau Mick Mulvaney says the agency doesn't need any more money right now. Every quarter the agency sends a budget request to the Federal Reserve, and for this quarter, Mulvaney asked for $0. Last quarter, then-Director Richard Cordray asked for over $217 million, and Mulvaney says the CFPB still has more than enough left over to run operations for now. Mulvaney has been critical of the agency in the past, calling it "flawed" and a "completely unaccountable agency." 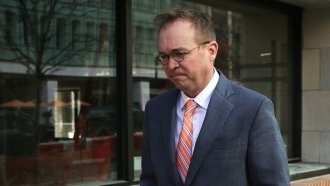 On Wednesday, Mulvaney ordered a complete review of the entire agency and all of its operations and asked for public input about whether it's fulfilling its function as a consumer protection agency.